We’re going to get into exactly what Flow is and how you can tap into it to do everything in business better. You’ll start to feel more in control of your business, happier with your work, more productive, and less stressed. There are so many incredible benefits that come along with tapping into a state of flow. First, let’s talk about what this flow state is. Think back to a time when you were completely immersed in your work. Everything was running smoothly and you were “in the zone.” You weren’t distracted, you weren’t thinking about other things, and you felt happy and productive. You were fully in control. Do you remember it? You probably got a lot more done in that time than you’d gotten done the entire week prior. Why can’t that happen more often, even most of the time? It can– I’m going to show you exactly how to enter “the zone” whenever you need to so you can be more productive. As you know, the more productive you are, the more profitable you can be. You’ll be able to work smarter, you’ll have higher-quality output, and you’ll be able to earn a lot more money overall. I want you to try a little exercise in getting into a state of flow. This exercise should allow you to instantly become more productive. Write down everything you have to do today, both big and small. These are all the tasks you would get done if you were a superhero. Now, circle the three tasks you deem to be most important to your business. For now, ignore the other tasks. Then, choose the top most important task – again, whether it’s a large task or a small task. Break that task down into its smaller parts if needed. Figure out exactly what do you need to do to complete this task, and by when? Which tools do you need? How can you make it easier? How can you make it more fun? Consider what your ideal mindset should be as you complete this task. Close your eyes and visualize yourself moving through this task and following it through to completion. See yourself smiling as you work, happily completing the task faster and more efficiently than you ever have before. Then, take steps to complete that task without doing anything else. Already, you should feel relaxed and ready to go since you’ve completely broken the task down into its smaller parts. It’s not a monster anymore; it even seems fun. You’ve also fed your mind with the exact visuals it needs to help you produce that ideal environment. This is just one exercise you can do to encourage your mind to go into a state of flow as you work. You may think that taking the time to plan will mean that you have to spend more time getting your work done, but the reality is you will get more done in less time by being prepared. There are certain things you can do to your external environment to facilitate entering into a state of flow. For example, you can set your to-do list ahead of time, break your tasks down into smaller chunks, clearly define your goals, create a positive work environment and eliminate distractions. Keep in mind that one person’s distraction can actually be useful to someone else. For example, some people need quiet to work, while others work best with music playing. There are also things you can do to your internal environment to facilitate entering into a state of flow. For example, you can make sure you’re doing work you’re intrinsically motivated to do. You can take steps to eliminate stress and to focus on what’s important in life and business. What Pulls You Out Of A State Of Flow? Now that we’ve talked about the conditions that make it easier for you to enter into a state of flow, let’s talk about what pulls you out of that flow or what stops you from entering into it in the first place. We all have bad work habits, but we can take steps to eliminate these habits or conditions. What I’m going to describe next is what holds you back in business. This is what makes it take longer for you to complete certain projects. This is what makes you feel negative about what you’re doing. This is what causes you to feel doubt and uncertainty with every step. The first step is to plan ahead. Look at your goals for the next six months. Then, break your goals down by month. Then, break those goals down by week. Finally, break this week’s goals down by day. What do you plan to accomplish today? Choose those tasks and get the rest of them out of your mind – all that matters is what’s in the present. Then, break down each of today’s tasks into their very smallest parts. You can do this in a checklist fashion so every single aspect is planned out. Make sure you get the tools and resources you need to succeed right away before you get started. The next step is to make sure you’re working at an optimal time. You can do your planning at any time but you can’t do optimal work and enter a flow state at any time. Make sure you eliminate distractions, work when you’re in top form and eliminate every stressor you can. Next, revisit your very clear goals and objectives. You have your to-do list and your plans right in front of you. But, why are you doing this? Why do you have these tasks set up for today? What are your bigger goals and plans? Why are you intrinsically motivated to follow through with today’s to-do list? Why are you externally motivated to follow through with these tasks for today? Answer these questions for yourself and you’ll be setting yourself up for success and more ready to enter into a flow state when it’s time to start working. Now, you’re ready to complete the visualization exercise I’ve described above. Close your eyes and see yourself working through those tasks. See how it plays out in the grand scheme of things and how confident you feel when you’ve checked off today’s to do list. The next step is to keep working without stopping. Everything is set up perfectly for you right now. There’s nothing to worry about and you can work efficiently and expertly. 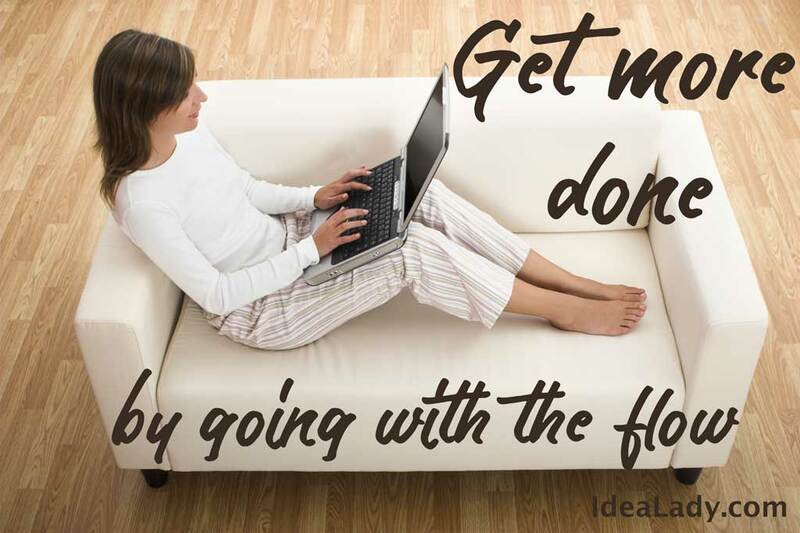 You can get much more done and you’re ready to enter into a flow state. You can’t force it, but it’s going to happen if you keep working and moving through your tasks without editing yourself, while letting your creativity shine through, and without over thinking it all. If you’re finding it difficult to follow these five steps to facilitate the flow state, I highly suggest you just keep practicing. The more you practice, the more easily you’ll be able to identify where you’re going wrong. Remember that this isn’t something you can force. This is something you can let happen. You have to take action and live action. You have to believe in your ability to achieve whatever it is you want to achieve. You need to practice entering into a state of flow to get more done in less time. You can truly spend less time working, feel happier in business, and earn more money at the same time. There’s nothing to stop you and nothing to get in your way. I usually just keep working on whatever feels good at the time. If working on my book, I’ll just keep going. If promotion, and I’m happy, I’ll keep doing. I have a master list, so everything will eventually get done by the end of the month, but I like to keep some flexibility in there. Jackie, I am planning a follow-up article about this. There is more than one method to be productive. Although planning is important (and you indicate you do plan) it can be very effective to, within that plan, do what you feel like doing at the time. I recently decided to “take a day off” and do whatever I felt like doing. It ended up being a super-productive day! Thanks for the comment! The Steps to Enter Into A State Of Flow Every Time Are Really Interesting And Very Informative.